Lengthen the life of your system by only powering it up when needed. Let Warmup Snow and Ice Electric Cable controls and sensors do the work for you. Warmup offers a selection of electric cable controls to suit your project. When to use the TF115-005 Simple thermostatic controller? This is really the budget add-on. The TF115-005 will switch 16A @ 120V and 12A @ 240V, and will only activate based on temperature. You set a temperature between 30°F and 40°F and the system will trigger, whether it snows or not. Not the most accurate, but the best value at under $200. Designed perfectly for small and medium-sized jobs, the TF115-005 controller will provide protection to roof and gutters. 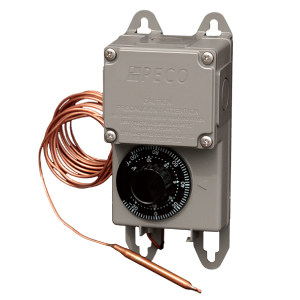 This controller is in a rugged, weather resistant enclosure, enabling placement most anywhere. It mounts near (or onto) the roof or gutter for accurate monitoring. It has a large, visible dial, allowing for easy & simple control of set points. When to use the ASE-DS9 controller? 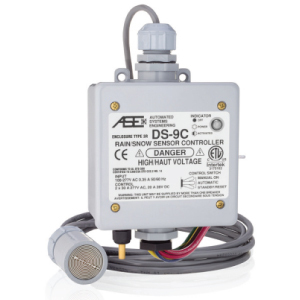 This controller is a wall-mounted controller with built-in sensor and 2x30A capacity (240V). Comes with a gutter sensor. When to use the WSM-63 controller? This controller is a timer panel with 252A capacity. Operate manually as Timer, or combine with optional sensors. Load capacity: 2 x 63A / 4 pole. When to use the WRS-2 – Automatic Roof-Deicing controller?